Written by Ethel Waxham Love, a Wellesley College graduate who went to Wyoming in 1905 as a teacher in a one-room schoolhouse, and her son, J. David Love, who later became an eminent geologist, Life on Muskrat Creek tells the fascinating story of a family’s day-to-day life on an isolated ranch in early twentieth-century Wyoming. Readers will be held in suspense as they learn about the family’s battle with a variety of challenges, including a near-fatal bout with Spanish influenza, life-threatening encounters with livestock and wildlife, and disastrous episodes of fires, flooding, blizzards, and drought. The book’s depiction of more ordinary events is equally engaging; Ethel describes becoming a wife and raising children without the support of neighbors, women friends, or a wider family network, and David recounts growing up in a wild and remote place where there was no local school to attend. Readers from all walks of life will find Life on Muskrat Creek to be a lively and provocative book. 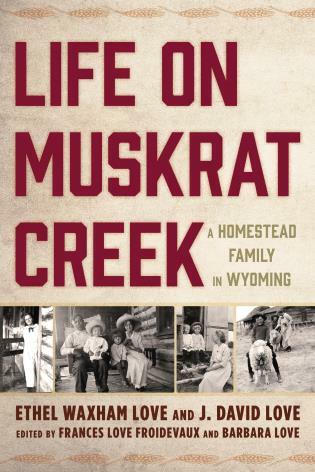 Life on Muskrat Creek is a riveting account of the realities of life on an isolated ranch in the early years of the Twentieth Century, a must-read for all who wonder what life was like back in "the good old days." Life on Muskrat Creek is well written and engaging, with dramatic, vivid, and often suspenseful stories. The material does much to enrich our understanding of ranching in early twentieth-century Wyoming, especially women’s and children’s experiences. The story of Ethel Waxham and John Love is one of the most poignant and memorable tales in the history of the West, where dreams and harsh realities have always collided. Life on Muskrat Creek is an important and unforgettable chronicle of hope and hardship in the real West.